Books. I have never loved books as much as I have as I do now, while raising young children. I’ve seen the magic of stories come to life, leap off the pages and into the girls’ imaginations. That being said, I’ve also noticed some serious twaddle make its way onto our bookshelves. Charlotte Mason’s definition of twaddle covers a large basis, but in reference to this conversation, it refers to low quality literature. On our bookshelves, twaddle looks like old, hand-me-down Bugs Bunny books with story lines focusing on how fat Porky Pig is and his journey to the gym (yes, seriously). It looks like princess books; not quality, classic fairy tales, but rather garage sale finds that offer lots of pictures and one liners on what makes a princess a princess (you must always sit prim and proper – gag). Though I support the idea that you should read books that interest your child, I also believe that gently steering things in a quality direction is imperative. As I put together our kindergarten homeschool curriculum, I went through our bookshelves and donated a lot of books. I also pieced together a book wish list to replenish the sparse shelves. Given, I will most likely be borrowing many of these from the library, but I’m hoping to acquire a few for keeps, too. There are a lot of classics that I’d love to read more than once and certainly with both Hailey and Kaitlyn. While we will be reading books as part of our Brave Writer Program, we will also be reading aloud at other parts of the day: the breakfast table, rainy afternoons, post baths in the evening. Though most of these will focus on Hailey’s (5 years old) level, I imagine Kaitlyn (3) will enjoy listening to and looking through some of these as well. And if all else fails, I’m going to just try and save up to buy the entire kids’ classics section at Barnes and Noble. 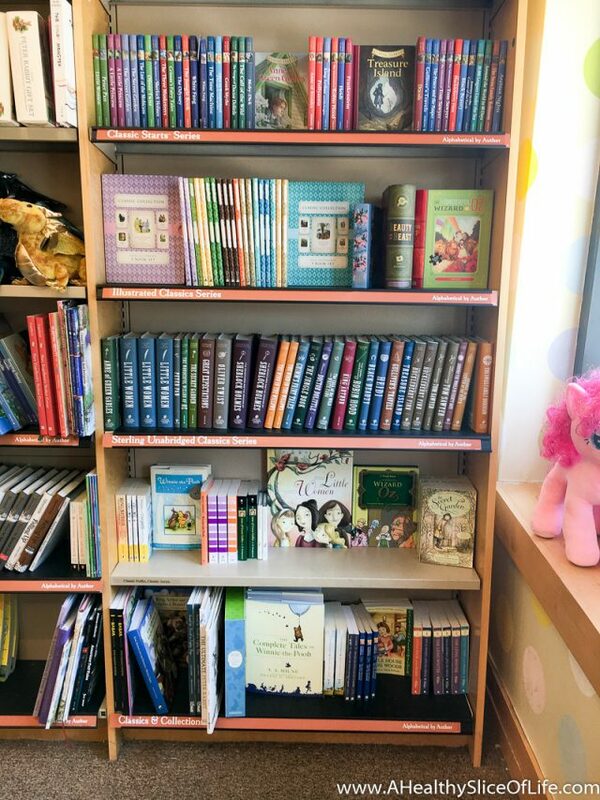 You don’t have to be diving into kindergarten homeschool to snag these books; most of them are highly recommended by kindergarten and first grade teachers, on the suggested reading lists for various homeschool curriculum, and are loved by parents from all over. Of course, I never believe you can read too many books, so do you have any suggestions on favorites to check out for the 5-7 year old age range? Or books you remembering loving when you were a kid? “National Geographic Little Kids First Big Book of Why”! Or really any of the NG books – always informative, but still exciting/interesting for children, and of course great pictures! I meant to thank you for your recent homeschooling post that detailed your thorough research, planning, curriculum, etc. – I literally took notes! Oh I will have to look into those, as I love anything National Geographic (documentaries, etc). I’m so glad you found my curriculum post helpful. I am loving the comments these posts are generating, as they are so helpful to me! My 5 year old boy has been loving Roal Dahl (Charlie and the Chocolate Factory, Matilda, etc) and the Fudge books by Judy Blume! LOVE those books! We just listened to Matilda (book on dvd from the library) and I basically giggled through the whole thing- it was one of my favorite books for sure. I will have to grab the BFG and his other great books too; great reminder- thanks! And I am planning on homeschooling Addie (and Cameron when she gets older … she is only 18 months! ), so I am loving your posts on the topic!! The Betsy-Tacy series by Maud Hart Lovelace is great too – the first half of the books about younger girls are for younger readers, the second half grow up in reading level as the characters do! Thank you for these suggestions; I’ll definitely look into them! Such a great list! Have you ever purchased books from Thriftbooks.com? They have used books (sometimes the ones we have gotten are brand new) at great prices – often less than $4!! You can use this link for 15% off too! Maybe you’ll find some of the ones on your list! No I have never heard of this but am clicking over now- thank you! I absolutely ADORED Madeline books when I was younger, and my daughter and I have read through all the ones our library has to offer. I also loved Anne of Green Gables, and can’t wait to read those with her (but maybe too young at age 5? I can’t decide). Another one of my favorites growing up was Slyvester and the Magic Pebble. I’m not sure it’s a “classic” but it sure brings back childhood memories for me! Haha I loved me some Twaddle growing up too- Babysitters Club baby!! I loved Nancy Drew too and really doubt that’s twaddle. Right? Ah well, loved it and will be reading it to Hailey and Kaitlyn for sure! Miss Rumphis. I grew up in New England and the illustrations of Maine are amazing. Plus the story is about a girl who wants to “Travel to far away places, live by the sea, and do something to make the world more beautiful”. Now that is a life motto I can get behind. side note: All of the Barabara Cooney books take place in a simpler time, and I love how she lets a child’s imagination blossom in each story. I want that life motto on my wall- I love it! And I’ll check out Miss Rumphis; thank you! FIrst, I love the word “Twaddle.” I’ve had to try and put a stop to twaddle coming into the house. We already have enough and it’s probably time to get rid of more. I know when I was little I LOVED the Little House on the Prairie series, and I also loved Anne of Green Gables, but that was when I was older. Definitely Charlotte’s Web, but also The Trumpet of the Swan and Stuart Little! Oh, and The Complete Adventures of the Borrowers… that might be for when the girls are a little older? I’m so bad at remembering what age is best. Haha! I joke that I know nothing about any age of kids except for the exact age my kids are at. Even now I feel like I know nothing about babies- haha! We just finished our kindergarten homeschool year and my daughter LOVED Charlotte’s Web and Little House in the Big Woods, but she also blew me away by thoroughly enjoying The Hobbit (which my husband read to her at night, which was a great change of pace for her and really special for them both I think) and The Lion, the Witch and the Wardrobe too. Even our 4 year old listened along and enjoyed them. Last year for preschool we read the My Father’s Dragon trilogy which was perfect for the younger ones. Oh and also anything by Thornton Burgess! He has great animal stories! Hmm, I guess the best advice I would give (that a bunch of other people have given me, so it’s not really MY advice!) is just to remember how little they still are and not get too wrapped up in finishing the workbook/checking off all the boxes/etc. The one thing I really remember from talking to homeschool moms of older children is they all wish they had taken a much more laid-back approach with the early grades. They all sort of sigh wistfully and say, oh, back then we should have skipped more school days to go to the park/zoo/etc. So that helped me when I was making our “schedule” for this year, I kept it to only 3 main days of lessons per week where we would do our math and reading curriculum, and the other days it was all just about reading books, doing art, visiting the library, and just learning through life (we were also involved in several very laid-back extra-curriculars through our homeschool group – book club, music class, ballet, etc.). It worked well for us! I’m excited to follow your homeschool journey on the blog, I love learning from other homeschool moms! We LOVE books in our house, and have so many for our kids. We began the Harry Potter series when my daughter was 6 1/2 and 2+ years later we’re halfway through book 6. 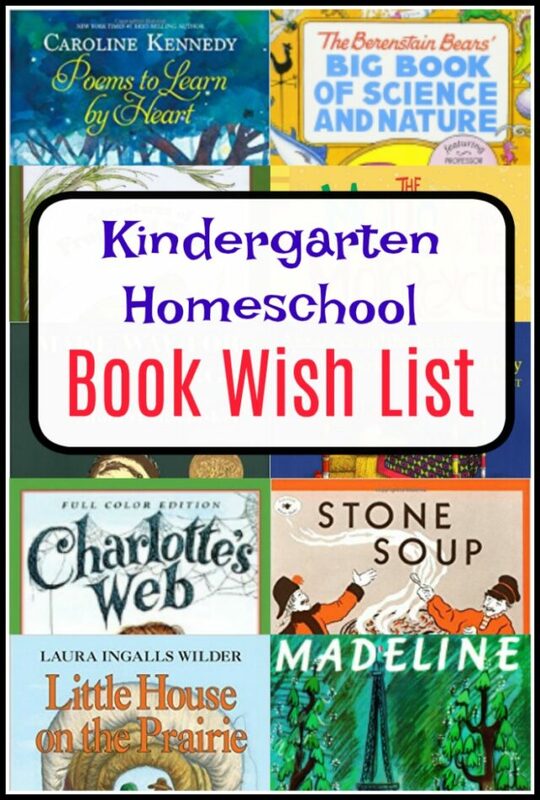 Though the subject matter is probably above your children in the later books the first 1-2 would be good and they are great read aloud books. Our children (almost 9 & 5) have also loved reading my old copies of The Boxcar Children series (that I asked my parents to save years ago) as well as several Roald Dahl books (James & the Giant Peach, Charlie & The Chocolate Factory, BFG, Matilda) and Dr. Seuss books have also been a huge hit since they were younger. Other great standalone books that we’ve read for years (though I’m not sure if these are all ‘classics’) are The Red Carpet, The Day the Crayons Quit, The Relatives Came, The Seven Silly Eaters, Blueberries for Sal. For poems we have both A Light in the Attic and Where the Sidewalk Ends both by Shel Silverstein and my kids both like reading those as well. Also, The Complete Tales of Beatrix Potter has been wonderful. I can’t say enough good things about the Classic Starts series of classic literature for children (in your picture above). We’ve gotten a bunch of those books and my son in particular has loved reading Swiss Family Robinson, Around the World in 80 Days, Treasure Island. What I like about those books is that they’re abridged versions of the full text, to ensure that the subject matter and language are appropriate for children and there are so many within the series that you can find something your child is interested in to keep them engaged (for my son that’s adventure and he has loved reading these on his own). Also, if you’re looking GREAT nonfiction short chapter books (approximately 100-120 pages) there is a fantastic series of “Who Was”, “Who Is” “What Is” books. Each one is about a specific person, event, place (etc) and they are written specifically for children. They have a timeline about the person’s life in the back of the book as well as a timeline of events going on in the world at the same time (which we love talking about). The books are short enough that children can read them on their own once they start chapter books and are interesting and engaging to keep their attention as well. Both of my kids have LOVED these books, going so far as to ask for them for their birthdays and holidays, and my oldest has done a book report on a few of them. These books have been a great way for them to learn about history, and they have sparked some great conversations. You can find them at Barnes & Noble and quire often your local library. Others that still on our list to read aloud (once we finish the Harry Potter series) are the Anne of Green Gables series, Huckleberry Finn, The Secret Garden, Stuart Little, Little House on the Prairie, Chronicles of Narnia. And finally two other series of chapter books that have both been good are Magic Treehouse books and the ‘Ivy & Bean’ series. Phew, sorry for the lengthy response but (as you can tell) I could go on and on about children’s books for hours!! Happy reading! I couldn’t agree more about The Illustrated Classics books that I just grabbed from Barnes and Noble. They are FANTASTIC and both girls actually are really into them (surprised me with Kaitlyn). I get giddy thinking of the day we can read Harry Potter as a family, but you’re right, probably not quite there yet. I’m jotting down several of your suggestions; I really appreciate the input! Great call on The Secret Garden and A Little Princess- right up my girls’ alleys! I love the idea of starting an Amazon book wish list too. I will have to look into this- thanks! We are currently reading at bedtime The Little House On The Prairie series. My 6 year old is loving it. It truly is the book I’m most excited about! One suggestion is Little House on the Prairie has a younger version of the books geared towards your kids’ ages. There are maybe 10 books in the series? My kids love them (and I love reading them too!) I definitely enjoy reading time when the books interest me as well. Magic Tree House has quickly become a favorite in our house. And they are education as well. My almost 4-year old gets really into the story lines as well. And they have them on DVD for long car rides. I didn’t know they had the Magic Treehouse on DVD- so cool! We have read a couple of those and I’m sure Hailey would really enjoy the DVDs. Thanks for the heads up! Amelia Bedelia was my jam growing up- loved her! And we’ve read a couple magic tree houses. H seemed to like them so I’m sure we will grab more in the future too. I do love the history woven into the stories! Would like to mention that there are several series of Little House books focusing on Laura’s Mother (the Caroline years) and grandmother (The Martha years – life in Scotland). I enjoyed reading these two series when I found out about them years ago as a pre-teen since I was a big fan of the other Little House books. One thing of note is that there is an older version of the these books, and a newer abbreviated version of those older books. 2 ideas- keep your eyes out at the dollar bin at Target and also Michael’s. they have there $1 versions of classics. 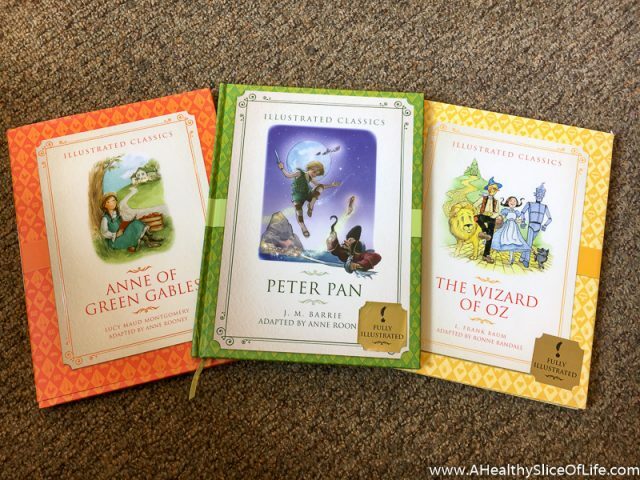 I have been buying them over the years and hey are mostly grade level 3 & 4 but great for saving for that age or read alouds- the secret garden, black beauty, little women, Heidi…..
Also scholastic.com – they often have $1 books. Another idea is ranger rick Jr and ranger rick – magazine subscriptions. GREAT gift ideas and we keep them on our shelves. With home schooling it could help build your nonfiction and spur other learning based on new things they learn or see. There is another one or two National Geographic puts out that we got for while…. You were the one that first got me hooked on the idea of magazines- I love them! I want to get a couple for H for the upcoming year. Great suggestion! The Magic Tree House, A-Z Mysteries, and The Box Car Children Mysteries are current favorites of my 5 year old boys. Bonus: we get the Audio books via Hoopla from our library an listen to them on long drives. Makes everyone happy! I second the Thorton Burgess books. They can take a little getting used to (older/British English), but all three of my big kids have liked them at 5.5-6.5yo. Those are the mainstay of our read alouds for that year. Some good early readers we have enjoyed: Wagon Wheels, Buffalo Bill and the Pony Express, Clara and the Bookwagon, The Big Balloon Race, Keep the Lights Burning Abbie, The Long Way Westward, and Doctor De Soto. Hi Brittany! I would love a post about what books Kaitlyn is loving right now. My daughter will be three in August and we are in such a book rut. I feel like we are nearing that stage where she is ready for a little more story than board books usually have to offer but I am having a hard time figuring out what to dive into next! Kaitlyn’s FAVORITE book is A Visitor for Bear (https://bonnybecker.com/2014/08/21/a-visitor-for-bear/) and in fact, we are big fans of all the Bear and Mouse books. I love them! We’ve also love The Circus Ship (http://www.chrisvandusen.com/books/the-circus-ship) and Dr. Seuss of course (one fish two fish is a hit). I also take her to the library and let her pick some out. Some are total busts, but others she actually picks out well! When my son was 3 we were really into reading the Llama Llama books and anything by Julia Donaldson (she wrote The Gruffalo and Room on the Broom, among many other hilarious books that are really fun to read aloud). I’m so surprised no one has mentioned the Ramona books by Beverly Cleary yet! There are 8 books in the series, and my five year old and I are LOVING reading them together — they are just as good as I remembered from childhood! The first 3 books are super super age appropriate for 4-5 year olds; starting with the 4th book, there are a few serious subjects woven into the plot (unemployment, kicking a smoking habit, parents fighting, etc) but nothing too mature — they’ve sparked some excellent conversations! I remember loving those books! I thought I remembered some “heavier” topics but now that you’ve said the first 3 might work well, I’m going to check them out. They certainly remind me of my childhood! Thanks for the rec! My son loved “The Wind in the Willows” when he was 4.5, and we recently started reading The Magic Treehouse series and Boxcar Children. They are lovely little stories, he loves the mystery aspect, and I think they also model really good sibling interactions and good manners/behavior. oh!!! Another big hit in our house was “Brambleheart” and it’s sequel “Bayberry Island” by Henry Cole. It’s a cute story about animals, a baby dragon, and adventure. Veiled in the story are some good lessons about interpersonal communication, bullies, loss of parents, etc. As you can see, I’m a big fan of stories and characters that model good social skills and behavior. So my definition of twaddle is anything that enforces stereotypes about gender roles, sibling rivalry, talking back to parents and teachers, etc. I’m super picky about that stuff (so is my hubby) so when we read it in a book, we always take a moment to discuss it with our son and talk about why it is wrong. One can never have too many books. We love going to the library, We cannot go there without checking out the maximum number of books allowed lol. My daughters love the Berenstain Bear books did you know there is a show based off the books?. Cam Janson books plus they have a younger Cam Janson series- by the easy readers in my library. Nate the Great books, Sleep Tight Farm a Farm Prepares For Winter by Eugenie Doyle, The Ox-Cart Man by Donald Hall. The Invisible String by Patrice Karst, Owl Moon by Jane Yolen, The Mitten by Jan Brett- or anything by her, The Nutcracker by Susan Jeffers has beautiful pictures and tells the story of the ballet. The Magic Treehouse books my daughter just started reading and seems to like them. Together we read Stuart Little and started reading A Christmas Carol. I think it was too old for them, and they just wanted to watch A Muppets Christmas Carol instead 🙂 We’re going to start to read this year Little House on the Prairie, Charlotte Web, The Wizard of Oz, The Trumpet of the Swan- but not all at once lol. I hope to read A Little Princess, The Secret Garden and all those old classics to them. Every month, when we take out books from the library I have a monthly reading log that I’ll write down the name of the book and if we liked it, If I’m teaching about winter, I can go to my December/January logs and either take out the books again, or look for new ones. For my daughter, I’ll have her write down her books in her own reading log. 🙂 Plus she’s being responsible for doing something she enjoys. Also if she to read it again, it make it easier to find instead of her trying to tell me what the book was about. Then I have to go searching randomly for it. If you want a book about a strong gal, I would highly recommend “The Paper Bag Princess”–she doesn’t need a prince to save her. She’ll do it herself! Oh I like the sound of that!